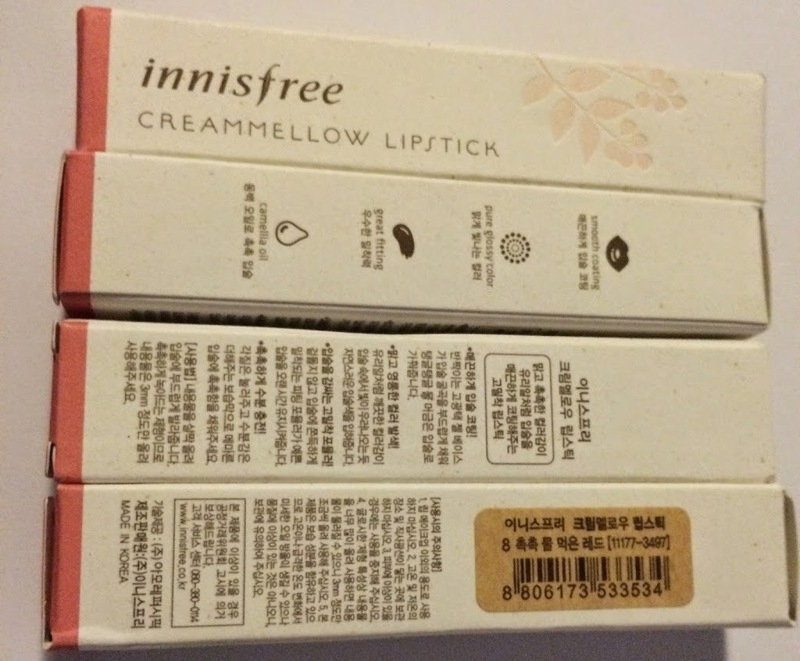 One of the main products that she used was the Innisfree Creammellow lipstick in #8, called “촉촉 물 레드”, which can be translated as Moist Dewy Red. Now, despite the fact that I work in a fairly conservative environment, I love a good red lipstick as much as the next gal (or dude). And the fact that these Creammellow lipsticks seem to have a really glossy finish only made them that much more attractive to me: I hate the feeling of wearing lip gloss but I don’t always like a matte lip. 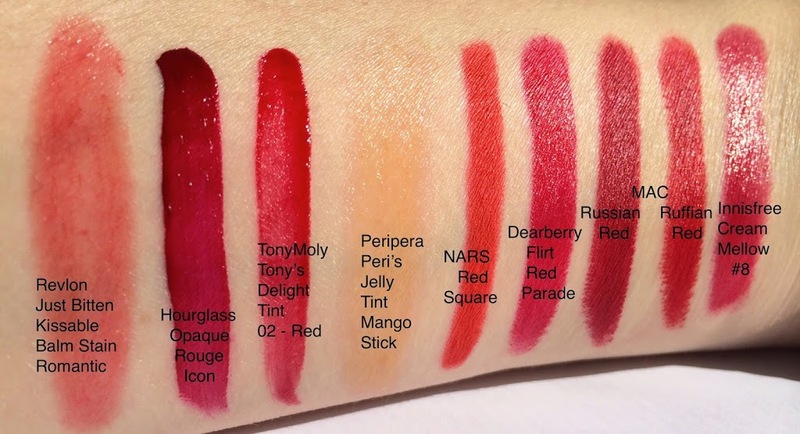 As you can see from their site here, the Creammellow lipsticks come in 10 different colors. I’m not rich enough to buy all of the colors just on the off chance that I’ll really like the formula, so I settled for 4 of them: #3, called “크림 코랄” or Cream Coral; #4, called “따뜻한 코랄 자몽티” or Warm Coral Grapefruit Tea; the aforementioned #8; and #10, called “라떼 브라운” or Latte Brown. And here are the lipsticks out of their boxes, in numerical order from low to high. The tubes themselves are fairly plain and utilitarian. While I love me some kitschy cuteness I’m not particularly offended by how sensible Innisfree’s packaging is, especially since their brand concept is eco-friendliness rather than showiness. The bottom of the tubes are clear so that you can tell which shade of lipstick you’re picking up without having to open the tube. This is useful and I wish more brands would do it. So let’s do a breakdown of the individual colors, shall we? #3 is more of a pink with coral tones than anything else. This was the only lipstick that went on a little patchy, and it’s my least favorite of the four. Obviously I don’t have another shade like this, which is not surprising since I’m not really a fan of pink. 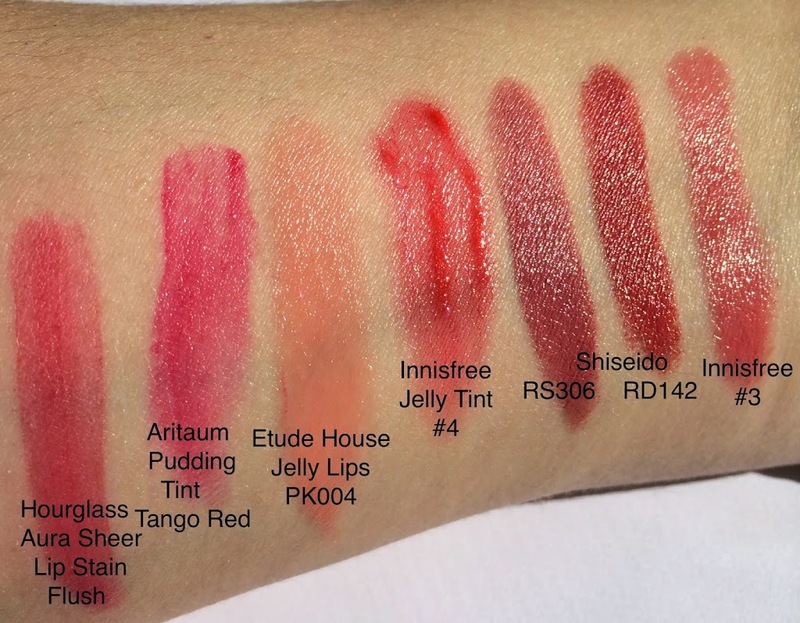 Note that the name of the Aritaum Tint includes the word “red”. I was mad about that. #4 is closer to a true coral than #3. This actually may be my favorite lipstick of the bunch. It went on the smoothest of all four. I love coral. Coral makes me happy. 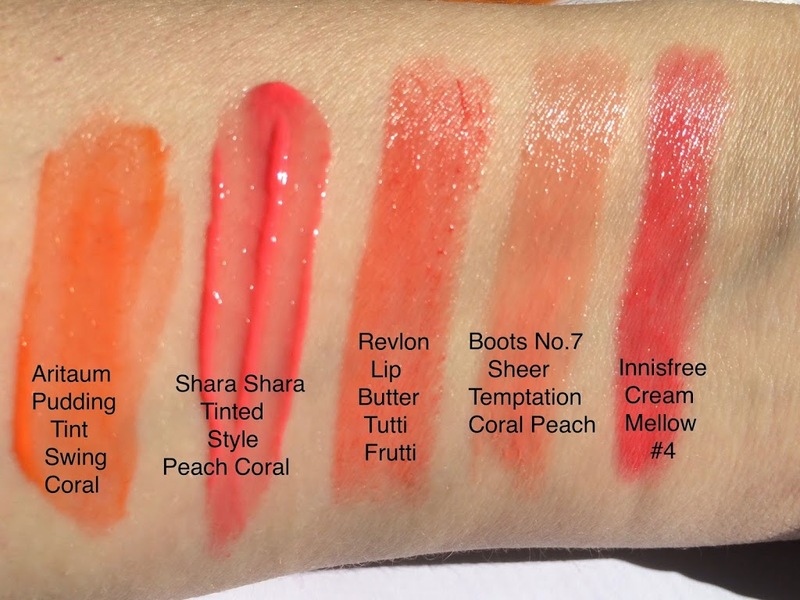 Of all my current lip products, the one that is closest to #4 in color is the Shara Shara Tinted Style Lip Stain in Peach Coral (which I got in a Memebox, by the way). Since they are different product types I see no reason why I need to choose one over the other, and I will happily use both. I don’t know what happened with the PeriPera Mango Stick. On my lips it turns a nice orangey red. What I was expecting from watching Pony’s video was exactly the finish that the Creammellow lipsticks have, but with a color closer to MAC’s Ruffian Red (which is my all-time favorite red). #10 is kind of a raisiny pink. 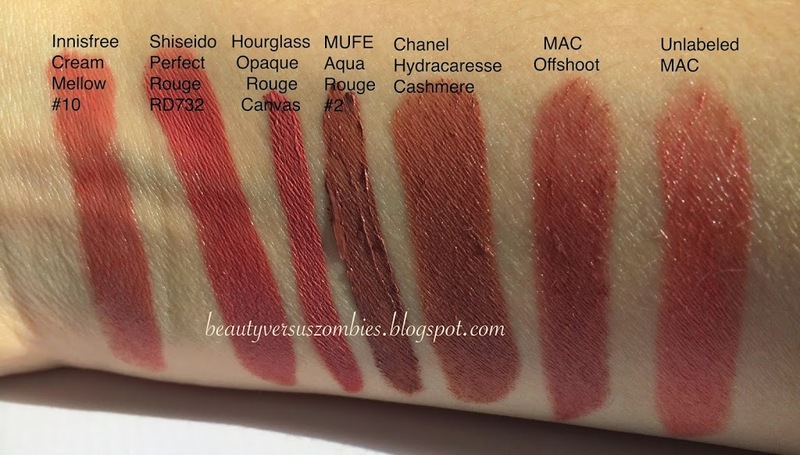 Not pictured but also very similar: Hourglass’s Fresco lipstick. It’s in my other purse. The unlabeled MAC was purchased as a ‘blemish’ off a wholesale website, so I don’t know which color it’s supposed to be. So overall, how do the lipsticks perform? Well, they do have a much more noticeably moist texture than my US lipsticks. They don’t go on incredibly smoothly, but they don’t drag either. I wore the lipstick as a test for about an hour and a half the first time, and it didn’t feather or settle in my lip lines. It is not, however, transfer or kiss-proof; I brushed up against some white fabric and it definitely left a mark. It doesn’t leave a stain behind on your lips, and I don’t find it to be drying at all. I wore #10 to work for a day; when we broke for lunch after four hours (during which time I had been drinking a can of soda) the color had faded a little around the center of my lips where the can had been pressed, but it hadn’t completely worn away and was still very visible. It’s not a heavy lipstick and it feels nice to wear, but if you don’t like the feeling of anything at all on your lips you’re better off sticking with a tint. None of the colors (except for #8) are screamingly bright, so they’re wearable for someone in a non-casual work environment. Like any lip product really, these will perform best if you have been nice to your lips – if you have exfoliated them and kept them moisturized. Innisfree now has an international site – you can find it here! Obviously I am nowhere near important enough to be affiliated with Innisfree, (and I did buy these lipsticks with my own money), but it’s nice that they have a site where you can browse in English. The down side is, of course, not everything is available on that site – and that includes the Creammellow lipsticks as of the last time I checked. 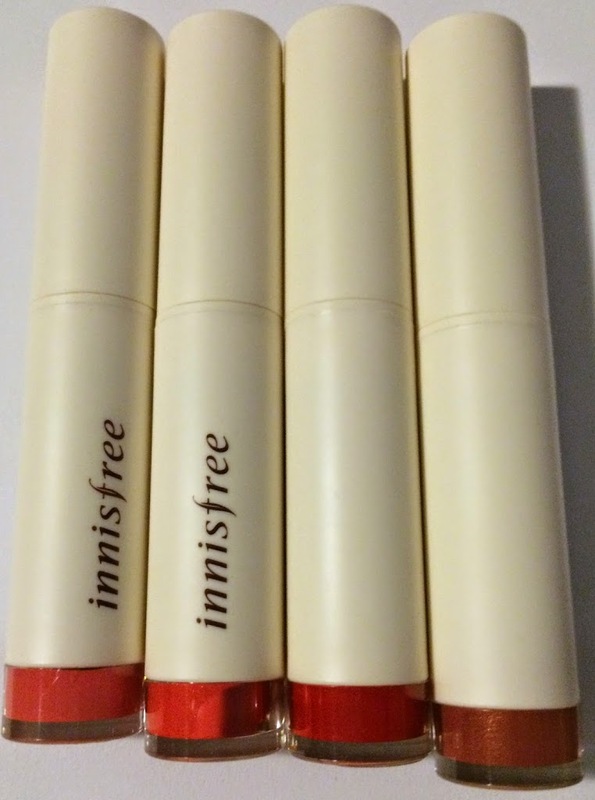 This entry was posted in Innisfree, makeup, review, swatch by BeautyVersusZombies. Bookmark the permalink. Next → Next post: Swatch-a-palooza!